Check out Bob Backlund’s WWE Alumni profile here! 1973: Bob Backlund debuted in the Minneappolis-based American Wrestling Association. 1975: Bob Backlund move onto the National Wrestling Alliance, were teamed with Jerry Brisco to win the NWA Georgia tag titles. 1976: Bob Backlund joined forces with Steve Keirn and won the NWA Florida tag titles. 1976: Bob Backlund wrestled throughout the Midwestern United States held the NWA Missouri Heavyweight title. 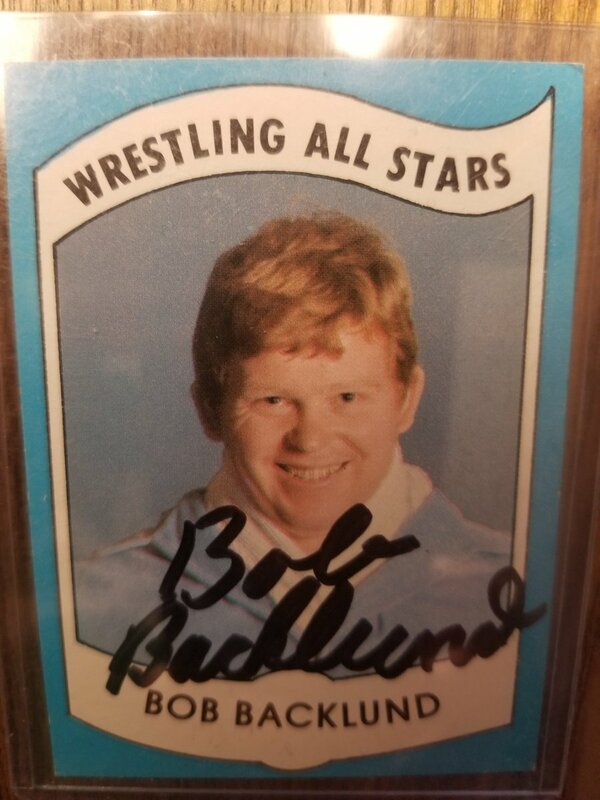 1978: Bob Backlund entered the World Wide Wrestling Federation and was managed by Arnold Scaaland. February 20, 1978: Bob Backlund defeated “Superstar” Billy Graham to win the WWWF World Heavyweight title. 1979: Bob Backlund travelled to Japan to defend the WWWF World title against the legendary Antonio Inoki. ~~~Inoki shocked the world by defeating Backlund for the title but refused to accept the Championship. August 9, 1980 – Showdown at Shae: Bob Backlund and Pedro Morales defeated The Wild Samoans to win the WWF Tag Team Titles! September 22, 1980 – WWF/NWA Title Unification: Bob Backlund defeated Harley Race by disqualification (DQ means no titles change hands). July 4, 1982: WWF World Champion Bob Backlund battled NWA World Champion Ric Flair to a Double disqualification at the Omni in Atlanta. December 26, 1983: The Iron Sheik defeated Bob Backlund for the WWF title when Arnold Scaaland (manager) threw in the towel. January 1984: Bob Backlund left the World Wrestling Federation shortly after and disappeared from the spotlight. July 1-2, 1992 – House Show: Bob Backlund defeated Skinner. July 12, 1992 – House Show: Bob Backlund defeated The Brooklyn Brawler. October 23, 1992 – House Show: Bob Backlund defeated Nailz. October 26, 1992 – House Show: Bob Backlund defeated Skinner. November 22, 1992 – Wrestling Challenge: Bob Backlund defeated Brian Costello. November 28, 1992 – Superstars: Bob Backlund defeated Tom Stone. December 4-6, 1992 – House Show: Bob Backlund defeated Kamala. December 13, 1992 – Wrestling Challenge: Bob Backlund defeated Barry Hardy. 1993: Bob Backlund made his inspirational return to the WWF as a mid-card babyface. January 3, 1993 – Wrestling Challenge: Bob Backlund defeated Dale Wolfe. January 22, 1993 – House Show: Bob Backlund defeated Terry Taylor. January 23, 1993 – House Show: Bob Backlund defeated The Berzerker. January 24, 1993 – Royal Rumble: Bob Backlund entered the Royal Rumble at #2 and lasted over an hour! January 24, 1993 – Wrestling Challenge: Bob Backlund defeated Louie Spicolli. January 25, 1993 – RAW: Bob Backlund cut a promo about Headlock on Hunger. January 30, 1993 – Superstars: Bob Backlund defeated Iron Mike Sharpe. February 15, 1993 – RAW: Bob Backlund competed in a battle royal which won by Razor Ramon. February 25, 1993 – House Show: Bob Backlund defeated Repo Man. March 7, 1993 – Wrestling Challenge: Bob Backlund defeated Al Burke. March 8, 1993 – RAW: Bob Backlund defeated Toni DiMoro. March 20, 1993 – Superstars: Bob Backlund defeated Larry Ludden. April 4, 1993 – Wrestling Challenge: Bob Backlund defeated Jeff Palls. April 4, 1993 – WrestleMania IX: Razor Ramon defeated Bob Backlund. April 5, 1993 – Monday Night RAW: Bob Backlund defeated Kim Chee. April 10, 1993 – Superstars: Bob Backlund defeated Anthony Howard. April 11, 1993 – UK Rampage: Bob Backlund defeated Damian Demento..
May 2, 1993 – Wrestling Challenge: Lex Luger defeated Bob Backlund by count-out to qualify for the King of the Ring tournament. May 3, 1993 – Monday Night RAW: Bob Backlund defeated Duane Gill. May 15, 1993 – Superstars: Bob Backlund defeated Terry Zeller. June 6, 1993 – House Show: Bob Backlund and Rick Steiner defeated The Headshrinkers. June 20, 1993 – Wrestling Challenge: Doink defeated Bob Backlund. June 27-28, 1993 – House Show: Mr. Hughes defeated Bob Backlund. June 29-30, 1993 – House Show: Bob Backlund defeated Beau Beverly. July 18, 1993 – House Show: Bob Backlund defeated Damien DeManto. August 15, 1993 – House Show: Bob Backlund defeated Bastion Booger. October 4, 1993 – Monday Night RAW: Bob backlund participated in a Battle Royal..
October 7-9, 11-13, 1993 – House Show: Bob Backlund defeated Papa Shango. November 8, 1993 – Monday Night RAW: Bob Backlund vs Barry Horowitz ended in a No Contest. November 28, 1993 – Wrestling Challenge: Bob Backlund defeated The Brooklyn Brawler. December 4, 1993 – Superstars: Bob Backlund defeated Iron Mike Sharpe. January 22, 1994 – Royal Rumble: Bob Backlund entered the Royal Rumble at #8 but was eliminated by Diesel in 2 minutes. Bob Backlund challenged Bret Hart to a WWF title match, after Hart won, Backlund snapped and turned heel! April 29-30, 1994 – House Show: Bob Backlund defeated PJ Walker. May 11, 1994 – House Show: Bob Backlund defeated Rick Martel. June 2-3, 1994 – House Show: Bob Backlund defeated The Brooklyn Brawler. August 8, 1994 – Monday Night RAW: Bob Backlund defeated Kevin Krueger by Submission. August 11-12, 1994 – House Show: Bob Backlund defeated Typhoon. August 13, 1994 – Superstars: Bob Backlund defeated John Paul. August 18-20, 1994 – House Show: Bob Backlund defeated Mabel. August 21, 1994 – Wrestling Challenge: Bob Backlund defeated Ron Cumberledge. September 3, 1994 – Superstars: Bob Backlund defeated Bert Centeno. September 11, 1994 – Wrestling Challenge: Bob Backlund defeated Tim McNeany. September 17, 1994 – Superstars: Bob Backlund defeated Tony Roy. August 29, 1994 – WAR: Bob Backlund defeated Prince Iaukea. October 3, 1994 – Monday Night RAW: Bob Backlund defeated Gary Scott by Submission. October 13, 1994 – Wrestling Challenge: Bob Backlund defeated Russ Greenburg. October 22, 1994 – Superstars: Bob Backlund defeated Thurman Sparky Plugg. November 12, 1994 – Superstars: Bob Backlund defeated Bert Centeno. November 14, 1994 – Monday Night RAW: Bob Backlund defeated The 1-2-3 Kid by Submission..
November 20, 1994 – Wrestling Challenge: Bob Backlund defeated Tony DeVito. November 21, 1994 RAW: Razor Ramon vs. Diesel ended in a double disqualification. ~~~Shawn Michaels, Bob Backlund, Owen Hart, Jeff Jarrett and others interfered in the match. November 23, 1994 – Survivor Series: Bob Backlund defeated Bret Hart to win the WWF Heavyweight title. ~~~Backlund’s cornerman, Owen Hart, tricked his own mother (also Bret’s mother) to throw in the towel. November 26, 1994 – MSG House Show: Diesel defeated Bob Backlund in 8 seconds to win the WWF Title!! December 12, 1994 – Monday Night RAW: Bob Backlund defeated Doink the Clown by Submission..
January 7, 1995 – Superstars: Bob Backlund defeated Bob Knight. January 15, 1995 – Wrestling Challenge: Bob Backlund defeated Nick Tarentino. January 22, 1995 – Royal Rumble: Bob Backlund was in a Royal Rumble match won by Shawn Michaels. February 2-3, 1995 – House Show: The British Bulldog defeated Bob Backlund. February 5, 1995 – Wrestling Challenge: Bob Backlund defeated Raven Clark. February 11, 1995 – Superstars: Bob Backlund defeated Lee Tobin. March 6, 1995 – Monday Night RAW: Bob Backlund defeated Buck Quartermaine by Submission..
March 11, 1995 – Superstars: Bob Backlund defeated Ken Raper. March 19, 1995 – Wrestling Challenge: Bob Backlund defeated Major Yates. April 2, 1995 – WrestleMania XI: Bret “Hitman” Hart defeated Bob Backlund in an “I Quit” match. August 2-6, 11-13, 1995 – House Show: Bob Backlund defeated Man Mountain Rock. August 16, 18, 1995 – House Show: Bob Backlund defeated Aldo Montoya. October 28, 1995 – Superstars: Bob Backlund defeated Bobby Clancy. November 5-6, 8, 1995 – House Show: Bob Backlund defeated Bob Holly. December 9, 1995 – Superstars: Bob Backlund vs. Savio Vega ended in a double count-out. December 11, 1995 – Monday Night RAW: Bob Backlund defeated Bret Hart by disqualification. January 21, 1996 – Royal Rumble: Bob Backlund was in a Royal Rumble match won by Shawn Michaels. February 24-25, 1996 – House Show: Fatu defeated Bob Backlund. February 27, 1996 – TWWF: Jimmy Snuka defeated Bob Backlund. March 2, 1996 – ECWA: Bob Backlund defeated Bobby Piper. March 15, 1996 – House Show: Bob Backlund defeated The 1-2-3 Kid. March 17, 1996 – NEW: Doink the Clown defeated Bob Backlund. April 13, 1996 – IWF: Fatu defeated Bob Backlund. April 19, 1996 – PCW: Bob Backlund defeated Dave Keller. 1996: Bob Backlund briefly returned as the co-manager of The Sultan (aka Rikishi). May 18, 1996 – Superstars: Bob Backlund defeated Roy Raymond. May 18-19, 1996 – House Show: Savio Vega defeated Bob Backlund. November 23, 1996 – IWF: Doink & Scott Taylor defeated Bob Backlund & Bulldozer. October 23, 1998 – BattlARTS: Alexander Otsuka & Hisakatsu Oya vs. Bob Backlund & Yuki Ishikawa ended in a time limit draw. November 13, 1998 – NWA CWA: Lance Diamond defeated Bob Backlund. November 23, 1998 – BattlARTS: Bob Backlund defeated SASUKE in the semi-finals. Yuki Ishikawa defeated Bob Backlund to win the B Cup. 1999: Bob Backlund made a very brief return as a mentor to Kurt Angle, but that storyline was scrapped. January 23, 2000 – Royal Rumble: Bob Backlund entered the Rumble at #14 and was eliminated by Chris Jericho. March 16, 2000 – Smackdown: Chris Jericho & Tazz defeated Bob Backlund & Kurt Angle by disqualification. October 7, 2001 – NJPW: Bob Backlund vs. Tatsumi Fujinami ended in a time limit draw. October 8, 2001 – NJPW: Bob Backlund & Tatsumi Fujinami defeated The Funks (Dory Funk Jr. & Terry Funk). October 12, 2001 – NJPW: Bob Backlund & Tatsumi Fujinami defeated Steve Keirn & Tony St. Clair. October 13, 2001 – NJPW: Bob Backlund & Dory Funk Jr. defeated Steve Keirn & Tatsumi Fujinami. March 2006: Bob Backlund signed for a WWE Classic Superstars action figure. January 14, 2007 – TNA Final Resolution: Bob Backlund appeared as a guest “judge” for Kevin Nash’s PCS Challenge Series Finale. January-February 2007: Mr. Bob Backlund had a minor roll on several editions of TNA iMPACT, Thursday Nights on Spike TV. February 12, 2007 – TNA Against All Odds: Senshi defeated “THE” Austin Starr (Bob Backlund put Starr in the Cross-face Chickenwing!). February-March 2007: Mr. Bob Backlund continued to appear on iMPACT building up a small feud with “THE” Austin Starr. ~~~Austin Starr attacked Mr. Bob Backlund after the match and applied the Cross-face Chicken-wing on him! March 29, 2007 – TNA iMPACT: Mr. Bob Backlund was out in the arena working out during the entire 1-hour program. April 26, 2007 – TNA iMPACT: Alex Shelley lured Mr. Backlund into the park where Chris Sabin attacked him and stole his book. May 10, 2007 – TNA iMPACT: Bob Backlund ran down and scoop slammed Alex Shelley and gave Chris Sabin the Atomic Drop! May 17, 2007 – TNA iMPACT: Bob Backlund confronted Shelley and Sabin but was attacked, then saved by Jay Lethal and Sonjay Dutt. June 17, 2007 – TNA Slammiversary: Mr. Bob Backlund (57 years old) defeated Alex Shelley despite interference from Chris Sabin. ~~~Backlund man-handled both Sabin and Shelley – Kevin Nash came down – Jerry Lynn came down – Jay Lethal made the save! July 12, 2007 – TNA iMPACT: Mr. Backlund and Jerry Lynn vs. Alex Shelley and Chris Sabin had an Oldschool vs. Newschool debate. July 15, 2007 – TNA Victory Road: Motor City Machine Guns (Alex Shelley and Chris Sabin) beat Mr. Backlund and Jerry Lynn. December 10, 2007 – RAW 15th Anniversary: Bob Backlund participated in a special Battle Royal featuring past RAW Super Stars! September 21, 2009 – NWA on Fire: Bob Backlund defeated Jason Rumble. August 11, 2011 – JCW: Bob Backlund defeated Ken Patera. January 21, 2013 – RAW: Bob Backlund is announced as an inductee into the WWE Hall of Fame. The ceremony will take place the night before WrestleMania 29 this April in Madison Square Garden. June-July 2016: Bob Backlund & Darren Young promo appears on WWE TV to make Darren Young great again. July 5, 2016 – Smackdown: Darren Young w Bob Backlund defeated Heath Slater in a dark match. July 11, 2016 – RAW: Darren Young w Bob Backlund won the #1 contenders battle royal for the Intercontinental title. July 13, 2016 – Smackdown: Darren Young & Bob Backlund were guests on the Miz TV. July 18, 2016 – RAW: Darren Young w Bob Backlund defeated Alberto Del Rio. July 19, 2016 – Smackdown Live: Darren Young w Bob Backlund and Zack Ryder defeated WWE United States champion Rusev w Lana and WWE Intercontinental champion The Miz w Maryse. July 19, 2016 – WWE Draft Live Special: Darren Young got drafted with Bob Backlund to be on Monday Night Raw. July 24, 2016 – WWE Battleground: WWE Intercontinental champion The Miz w Maryse vs. Darren Young w Bob Backlund ended in a no contest to retain. September 5, 2016 – RAW: Darren Young w Bob Backlund defeated Jinder Mahal. September 23, 2016 – Superstars: Darren Young w Bob Backlund defeated Curtis Axel. October 7, 2016 – Superstars: Darren Young w Bob Backlund defeated Jinder Mahal. October 14, 2016 – Superstars: Darren Young w Bob Backlund defeated Jinder Mahal. October 21, 2016 – Superstars: Darren Young w Bob Backlund defeated Jinder Mahal. November 18, 2016 – Superstars: Jinder Mahal defeated Darren Young w Bob Backlund. December 9, 2016 – Main Event: Darren Young w Bob Backlund defeated Jinder Mahal. January 5, 2017 – Main Event: The Shining Stars (Epico and Primo) defeated Bo Dallas and Darren Young w Bob Backlund. April 20, 2018 – AJPW: Bob Backlund, Riki Choshu & Tatsumi Fujinami defeated Jinsei Shinzaki, KAZMA SAKAMOTO & TAJIRI. April 21, 2018 – AJPW: Masakatsu Funaki, Riki Choshu & Tatsumi Fujinami defeated Bob Backlund, Hiro Saito & Yoshiaki Fujiwara. Kendra Bunyon wrote: Over the past couple months (Summer 2009) Bob Backlund has been appearing on NWA On Fire (Maine). Wikipedia has Backlund listed as a promoter for the NWA territory, but I am not sure how accurate that is as I found nothing about it on their actual website. Though their site is kayfabe. Dr. Steven M. Lipson wrote: I remember Bob backlund’s career well under the Vince McMahan organization. backlund was the all-American type of wrestler. He couldn’t speak well during the interviews.but he made up for his dull character by his great technical skills in the ring. backlund wouldn’t play the game to extend his career. McMahan saw that the fans started looking at Bankjland as dull, but Bob wouldn’t change. Perhaps he had no ability to put on a heel alter ego. When McMahan finally severered all ties with Bankland. backlund went to competitor prowrestling groups (I nelieve the then WCW was one at them). I actually heard Backiland say in an interview segment , “They took the title from me.” I couldn’t believe what I heard. I’m sure this statement spread throughout the country among the few wrestling promoters. I’m sure this statement was the final nail to the coffin. backlund’s return as a heel to McMahan’s promotion was just insulting (to backlund and to the fans). The fans had great memories of Backand as a great champion for 5 years. His comeback made the old time fans and the new generation of fans look at backlund as a lunatic. I wish backlund all the luck in his work in Conn. and his move into local politics. @BranndonKelley @OxSawyer @IMetAWrestler1 @WWE @HulkHogan @the_ironsheik @AskMrBacklund @WWEUniverse @HogansOrlando This was in Clearwater, I still need to make the trip to @HogansOrlando . @BranndonKelley @SegoBrent @IMetAWrestler1 @WWE @HulkHogan @the_ironsheik @AskMrBacklund @WWEUniverse @HogansOrlando They have the battle bonnet (fist helmet) and Macho Man's hat from the Funeral Parlor where Hulk was attacked by Undertaker & saved by Piper & Savage.